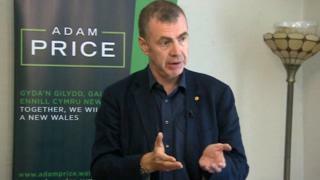 Image caption Adam Price: "Ultimately people respond to passion"
Plaid Cymru leadership contender Adam Price has rejected the idea of coalition with the Tories or Labour after the next assembly election. He was responding to claims by current leader Leanne Wood that he and Rhun ap Iorwerth would "quite possibly" strike a deal with the Conservatives. Both Mr Price and Mr ap Iorwerth are challenging Ms Wood for the leadership. Mr Price told BBC Wales' Newyddion 9 programme that Plaid Cymru should focus on building a positive message. Plaid Cymru ministers served in government from 2007 to 2011 as the junior partners in a coalition with Labour. But Mr Price insisted that the idea of a coalition involving Plaid Cymru after the 2021 election should be "taken off the table". "The mandate I would seek from the members of Plaid Cymru is a very clear and singular one which says 'no' to a coalition with the Conservatives absolutely, but also says the same to the other 'Conservative' party, the small 'c' Conservative party, the party of the status quo who's been running Wales for the last 20 years," he said. The Carmarthen East and Dinefwr AM said he would fully support Ms Wood as one of his closest friends in politics if she was re-elected, but he claimed Plaid had been stagnating under her leadership. "We have to win - currently we are not on the right track," Mr Price said. "We have to change gear and concentrate on success. We have to admit, apart from some success here and there, we have been standing still. "We are, according to the latest poll, 17 points behind Labour. There is something we are obviously not doing at present." Mr Price described Welsh politics as "a landscape devoid of ideas" which needed a "great re-set". He told the programme that independence could drive the nation forward. "Plaid maybe has been nervous about using the 'I' word - 'don't frighten the horses' or something. "It doesn't make any sense because ultimately people respond to passion. "People like people with dreams. Our ultimate vision is a positive one - a prosperous, confident, independent nation." The result of the leadership contest will be announced on 28 September, a week before Plaid Cymru's autumn conference.